Maptitude has specialized versions for those who need to add various capabilities to their sites. Maptitude for the Web allows you to add interactive mapping to your web site. Maptitude for Redistricting includes tools for creating, analyzing, and mapping congressional, state legislative, city council, county commission, school, water, or any other type of districts. Maptitude for Precinct and Election Management combines sophisticated mapping software, an easy-to-use interface, and a wide array of customized data to create a complete precinct and election management solution. GISCafe Voice: What current enabling technologies is the new release 6.0 relying on or maximizing in order to offer specific functionality? Stewart Berry: The latest Maptitude is a complete refresh in terms of maps and graphics, database handling, routing functionality, data, and performance. The graphics improvements include a new automatic map labeling engine as well as better style display and output options such as transparency. The underlying relational database has been expanded to allow one-to-many non-aggregate joins, which are critical in analyses such as querying the employees at a site(s). Support for additional formats, such as Microsoft SQL Server Spatial, reinforces the robustness of the Maptitude database engine in distributed environments. Accessing and visualizing image layers is a core aspect of the new capabilities provided in 6.0, with new features such as interpolation and smoothing. Maptitude now supports several open and international standards including OpenGIS Web Map Service (WMS) imagery. GISCafe Voice: What would you say is the single most important new feature of the release? Berry: The single most important new feature of the release is unlimited geocoding (address locating) and drive-time zones based on high quality and accurate street data. Address geocoding is fundamental to decisions based on geographic data. Maptitude provides tools to assess and review match success rates based on updatable and reliable street data, while providing alternative levels of accuracy and modifiable geocoding rules. GISCafe Voice: Does 6.0 work on mobile devices such as iPads, etc.? Berry: Maptitude runs on Windows, and Maptitude for the Web applications are accessible via browser-based interfaces on other devices. GISCafe Voice: How is the new addition of U.S. Census Data used by your customers? Berry: Users are able to explore the most up-to-date U.S. demographics and how these relate to their areas of interest. They can quickly visualize Census information using a suite of wizard-driven tools. Maptitude also provides a map library that contains pre-designed maps listed by Census category. These include thematic maps of demographic, social, economic, and housing data by ZIP Code, Tract, County, and State. The Map Librarian lets users open one or more of these maps, allowing them to quickly analyze U.S. Census data for their chosen location. GISCafe Voice: Does the product still offer a lot of free data? Berry: Unlike many other mapping and GIS software packages that require separate data purchases, Maptitude includes extensive geographic and demographic information so that users can get started as soon as they open the box. New U.S. data sets provide access to up-to-date geographic information. Maptitude now includes a NAVTEQ street layer, allowing accurate address locating and street visualization, plus robust data on which to calculate best routes and drive-time zones. Other new U.S. layers include urban building footprints, highways, railroads, landmarks, and the latest quarter of nationwide ZIP Codes. The points of interest layer contains over 2 million named locations that range from public facilities to commercial buildings including shops, restaurants, and retail stores. 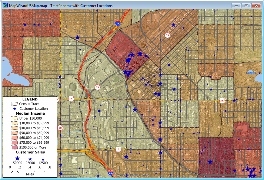 All of the 2010 U.S. Census boundaries that are included with Maptitude, plus 3- and 5-digit ZIP Code areas, contain several demographic and economic variables based on the 2010 Census and the American Community Survey. These include race, gender, age, ethnicity, household, and income fields. GISCafe Voice: Who are most of your customers? Berry: Our customers are as diverse as spreadsheet users, with organizations of all sizes and types realizing benefits when exploring their data with Maptitude. GISCafe Voice: What is the cost of the new release? Berry: A new single user license of Maptitude costs US$695, while an upgrade costs US$395. This entry was posted on Monday, November 14th, 2011 at 8:16 am. You can follow any responses to this entry through the RSS 2.0 feed. You can leave a response, or trackback from your own site.